The gist of the above Pāḷi passage is: In regard to a Vipassanā Yogī who has achieved strong meditation (Balavavipassanā) for having accomplished with Nibbāna-ñāṇa, etc. When visible object, etc, are felt through cakkhudvāra, etc., even if improper thoughts arise in him at the moment of determining consciousness, he would pursue once or twice and then the mind only enters into life-continuum and subsides. No feeling of sensual pleasures would occur. If it so happens, he is deemed to be a quickwitted meditator who has reached the highest. To a mediocre meditator of vipassanā, impulsive consciousness arises once as prompted by rāga, etc. However, when such impulse disappears eventually, since he would bear in mind that “impulsive consciousness as prompted by rāga (lust) has occurred in me”, he puts a check on the impulsive consciousness and continues to contemplate on it. (Although contemplating is made at the end of the impulsive consciousness javana, he has done so only after the lifecontinuum). Again when the second cause of cognitive processes takes place, no consciousness tainted with rāga will occur. In respect however of the inferior type of meditator, although he would contemplate and note only once, when the second course of consciousness arises, consciousness prompted by rāga occurs again. At the end of the second course of cognitive process, he knows and reflects that “the impulsive consciousness has gone and disappeared”, and by contemplating and noting it, he is able to keep control of object. On the third course, the mental impulse tainted with rāga will cease to occur. Among the three types of individuals mentioned by the said Aṭṭhakathā, the third kind of individual is Mandavipassanā, the second is Majjhimavipassanā, and the first is Tikkhavipassaka. Putting it in another way, the third type of individual is a person who is endowed with the inferior Balava-vipassana, whereas the second and first types of individual are those who are endowed with mediocre and superior kinds of balava (vigorous) vipassana, respectively. Amongst these individuals, as regards mandavipassaka, despite the fact that noting is done by him in respect of kilesa which arises during the cognitive process at the moment of seeing impulsive consciousness associated with defilement occurs again. Thereafter, when consciousness is again noted, and impulsive consciousness, relating to defilements, will cease to occur. Only wholesome consciousness of kusala (meritorious acts), and also Vipassanā will take place. What has happened to the second type of individual in this regard has been already described previously. As regards the first Tikkhavipassaka, although improper reflective thoughts appear in him when coming into contact with the sense-objects that are likely to evoke the mental defilements, such reflective thoughts would not be strong enough due to the effect of the previous practice of contemplation and noting. Hence, pañca-viññāṇa (five kinds of consciousnesses), sampaṭicchana (recipient consciousness) and santīraṇa (investigating consciousness) cannot take up the sense-object with clarity.Since these thought cannot grasp the sensations clearly, manodvārāvajjana (mind-door adverting consciousness) called vuttho (determining consciousness)being also unable to distinguish and decide whether they are lovable, or hateful, etc., occur two or three times. Referring to the repeated arising of the consciousness which occurs thereafter, depending on the past mental thoughts and their behaviours, it is said to be āsevanaṃ labhitvā, i.e. 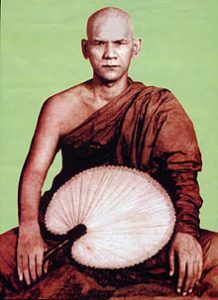 have obtained the practice or habitude.It is not however intended to imbibe repeated (āsevana paccaya) and its conditionally arisen states.Though it happens thus two or three times, because of its inability to make determination, life continuum arises instead of impulsive consciousness (javana).In the mind-door also, the cognitive process ending with determining consciousness may appear. It would appear as if something is seen with the eye, or the sound is heard, or something is imagined. When it so happens, it might become inconspicuous.When rising from the lifecontinuum (bhavanga), vipassanā consciousness at the minddoor which contemplates and notes the extremely vague act of seeing, might occur. To such a person, there is a cessation of kusala and akusala impulsive consciousness at the five sense doors (pañcadvāra). Only at the mind door, Vipassanā consciousness arises. As mental impulse ceases during the first Vīthi (cognitive process), the object of consciousness becomes very vague and obscure; and in the second cognitive process of mind-door, tatramajjhattupakkhā, which causes equanimity, becomes obvious and then, when Saṅkhārupekkhā-ñāṇa is strengthened and active calm vipassanā-consciousness, i.e., steady contemplating and noting, will take place. When this stage of ñāṇa – insight knowledge – is reached by practising meditation, it will be found conspicuous with one’s own personal knowledge or realization.